Basic sketches for the pedometer appear in Leonardo Da Vinci’s work from the 15th century. Fortunately, design and technology have come a long way since then. Today’s activity trackers offer far more than the counting of steps, and they’re no longer clunky, pager-like devices that you have to clip to your belt. They’re wearable technology: light, sleek, and ultra portable. But with so many options available, finding the best tracker for your needs can be tricky. To save you time reading lots of product reviews, here’s a brief guide to the best activity trackers. If you’re always on the move balancing work, home, and travel, an added personal device is the last thing you need, right? Maybe not. Some companies have designed activity trackers to suit the needs of the busiest user. For an activity tracker you can carry without worrying that it’ll get damaged or lost, a wrist based device is your best option. The Fitbit Flex and Jawbone UP are two activity trackers that come in a sleek bracelet form. However, there are some notable differences between the two. Jawbone UP: The Jawbone UP’s slick thin clasp bracelet is stylish enough for Gwenyth Paltrow. Why not you? 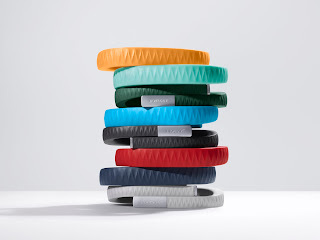 Weighing in at merely one ounce, the Jawbone UP is available in eight different colors. It comes in three different sizes: small, medium, and large. (If you happen to be in between sizes you have to settle for the one that fits the best.) It’s also water resistant, so feel free to hop into the shower with your tracker on. The Jawbone, however, doesn’t have a display on the device itself to show your progress and stats. Fitbit Flex: While the Fitbit Flex only comes in two colors—black or slate—you can buy an accessories pack and receive a variety of colorful changeable bands. It also comes in two sizes, but it allows for adjustments through notches on its silicon rubber band. Although it lacks space for a proper display, the Fitbit Flex does boast flashing LEDs on the side that tell you how close you are to your daily goals. Jawbone UP: Jawbone UP boasts up to 10 days of continuous use per full charge cycle. Part of the explanation for how it can go so long without charging is the fact that the Jawbone does not automatically sync via Bluetooth. In order to upload collected data, you have to sync it manually with your phone through the headphone adapter piece on the device. But Jawbone’s mobile “UP platform” stores all of your activity data and allows for seamless integration with a variety of other mobile applications like MapMyFitness, Runkeeper, LoseIt!, and MyFitnessPal. Fitbit Flex: What it lacks in battery life, the Fitbit Flex makes up in automatic Bluetooth syncing to your phone or computer. Finally, both the Jawbone UP and Fitbit Flex have bonus features like sleep analysis and silent alarm functions. You can buy the Jawbone up for $129 and the Fitbit Flex for $99.95. When you squeeze an activity tracker into the size of a bracelet, you have to give up a few features. For those consumers looking to gather a wealth of data concerning their day-to-day health and fitness level, look to the Fitbit One, the Flex’s older brother, and the Basis B1. Fitbit One: The Basis B1 and Fitbit One differ quite a bit when it comes to design. One of the more well known and recognized trackers on the market, the Fitbit One is most easily identified by its silicon skin, USB-like shape and metal clip back. Unlike the Flex, the Fitbit One has an LED screen that displays your stats in real time along with motivating messages. Basis B1: The Basis B1 takes the form of a widely recognizable object: a dark black sports watch. The B1 screen is more navigation friendly with physical buttons that let you access real time data: calories burned, steps taken, heart rate, and other useful information like the time and date. In terms of design, the real difference between both devices comes down to preference of a wrist-based device or a clip on. The Fitbit One and Basis B1 offer a lot of the same basic activity information: steps taken, steps climbed, calories burned, goals reached, and hours slept. Both devices have mobile apps that allow you to check out graphs and analysis of activity levels at your convenience. Both devices also sync via Bluetooth. But the Basis B1 goes a step beyond the Fitbit with its heart rate, perspiration, and body temperature monitors, which allow for a better whole-body analysis. You can buy the Basis B1 for $200 and the Fitbit One for $99.95. A recent study found that nearly 32 million Americans will start to use health tracking mobile devices. So whichever device you choose, an activity tracker is a step in the future of personal technology. It’s also a step forward for your health and wellness. Angie Picardo is a staff writer at NerdWallet, a financial literacy site dedicated to helping people improve their lives and save money, whether it’s learning how to plan an effective budget, finding the most economic fitness gear, or understanding the politics of mortgage rate locks. Photos courtesy of Fitbit and Jawbone.